Microscopic technique is the set of techniques and rules of communication and working with microscope and its auxiliary parts. When working with a microscope first of all it is necessary to protect it from contamination (in between his work served a glass or cardboard hood). Not recommend to remove the lenses: moved the thread and disrupted their alignment. Optical part carefully wipe washed many times uncontaminated Batiste or linen cloth, traces of dirt removed a tampon moistened 95% alcohol, and then wipe dry swab. Oil is removed from the surface of the lens with a soft dry cloth, and its residues can be removed by xylene. With mechanical parts of the instrument remove dust. Complex cleaning and lubrication is made by the specialist. Work with modern microscopes requires rational lighting, careful choice of the optical system of the lens - eyepiece - condenser", as well as subject and integumentary glass of high quality, relevant training of drug - research object. As a point light sources serve illuminators OI-7, OI-9, OI-18, OI-19, equipped collector lens. Illuminator installed at a distance of 30-40 cm in front of the microscope. It should not be too bright lighting field of vision, as it reduces the quality of the image. Setting lighting, regulate the angular aperture of the condenser fully open aperture the aperture and closing the aperture fully fields (header), see in the microscope glowing circle (aperture). Then gradually narrow the aperture the aperture until the moment when the field of view will be seen spot without blue or green border. Image quality depends on the rational use of lenses and eyepieces. Using various combinations of lenses and glasses, you can get different magnification. However, the increase should be determined primarily by the object, the objectives of the study and resolution of the microscope. With microscopy, as a rule, are applied immersion lens (oil, water, glycerin). To get good images without the use of glass cover is recommended to use special immersion oil, a drop which is inflicted on a PAP smear, located on a slide. When working with immersion lens to be very careful to omit the tube so as not to damage the front of the lens. Image quality depends on the thickness of the glass (not more than 1,1-1,4 mm) and the top piece of glass (not the thickness of 0.15-0.17 mm). Auxiliary devices by microscopy are: heating table, an eyepiece micrometer, object-micrometer, drawing apparatus and micromanipulator. Heating table is installed instead of the subject table. The degree of heating is regulated by the thermostat. The drug is at such a table is set as the stage of the microscope. An eyepiece micrometer enables measurement of the observed objects. With this aim, focus lens on the scale object-micrometer, each division which is 10 MK. An important section of microscopic technique is the sketch of the object of research. Figure can be done visually, or more precisely by means of drawing of the machine. When visual method, look in the microscope left eye and right and follow the movement of pen-on-paper. Drawing apparatus is placed on the barrel of the microscope. Mirror discards through the prism of the image of paper and pencil drawing in a plane eye point eyepiece, eyes, so the observer at the same time sees the object, the paper and the pencil tip. The micromanipulator allows for fine and precise movement of micro tools and perform in the field microscope some operations on the cell (removal and transplantation of nuclei, injections of various substances, cutting of various parts of cytoplasm and so on). It consists of a system of supports, provided with a screw clamping micro tools that provides movement to perform in all directions. Living organisms (bacteria) are placed on a glass slide in a drop of the most appropriate environment for them (you can isotonic solution of sodium chloride), cover cover glass (crushed drop), consider in transmitted light in the bright and dark field. Fixed and stained preparations bacteria produce in the form of smears or fingerprints (see the Colour of microorganisms). Microscope drugs - see Microscopy. Cm. also Microscope. 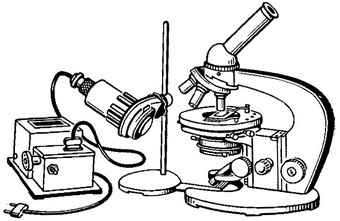 Microscopic techniques - handling and working with microscope and its auxiliary devices. An important condition of success of microscope - lighting installation. Only under optimal lighting according to Keller (Fig. 1) you can implement all the features of the microscope. To install lighting on Koehler, you must have the standard illuminator type OI-7 (Fig. 2) or RI-19 with microarray (with a small, tightly rolled coil), which can be moved along the axis of the light source. In this light microlana focused by the lens-collector, and at some distance from the illuminator occurs a sharp image of a spiral lamps. Size of the limited lens iris-diaphragm variable. Sharp image of a spiral lamp is directed through the microscope mirror on closed to failure diaphragm condenser, representing the intensity of a short-focus lens system that collects all incoming her luminous flux in a very small area of the object. All the illuminator move on the table as long as the image of a spiral lamp will not cover the whole diaphragm condenser. This moment notice, looking from the front, flat mirror microscope, which reflects the diaphragm condenser. If necessary, the lamp in the luminaire move along the axis, while the image of a spiral is at the desired size, and then completely open the diaphragm condenser. Fig. 1. A schematic representation of the rays in the coverage of the preparation method Koehler: 1 - filament lamp; 2 - manifold; 3 - aperture field; 4 - the image of the filament lamp in the plane of the aperture stop; 5 - aperture stop; in - condenser; 7 - the image edges of the aperture of the field in the plane of the drug. Fig. 2. Microscope MIM-1 with illuminator OI-7. Then on the object table of the microscope put the product and focus on the lens, you want to work. Looking into the eyepiece, the movement of flat mirrors to achieve best in these conditions. Then shut to lock the aperture of the illuminator. If the image disappears from sight, you must return the movement of the mirror. Raising or lowering the condenser, try to make an image of the diaphragm illuminator sharp. This determines the optimum height of the condenser and its interaction with this lens (lens small increases necessary to Unscrew the top lens condenser to coordinate its work with the possibilities of the lens). When changing the lens, the image of a closed aperture illuminator again to focus on the focal plane of the lens. The movement mirrors the image of the diaphragm of the light source is switched to the center of the field of view. If the edges of the image is colored differently (one pole blue, the other reddish), this means that the axis of the light source inclined to the vertical plane of the microscope. Looking through the eyepiece, move the illuminator manually so that the coloring of the edges of the image was the same throughout its circumference. Illuminance field of vision becomes uniform throughout the area. It remains to disclose the aperture of the light source so that her image exactly fit into the field of view of the lens. Luminous flux will be used completely, and will not have excessive light beams that can produce noise in the image. Now with the help of a rheostat, changing the power illuminator, establish such intensity lamp, in which the eyes are not tired excessive brightness and easily distinguish the smallest details. Lighting installation on Keller is a prerequisite skilled work with the microscope. Violation of the right lighting, inevitably leads to a loss of resolution and contrast, to the optical errors, especially when micrograph and microinnochange. To modern microscopes lend themselves to a variety of devices for automatic and semi-automatic installation of lighting. Their use facilitates the installation of lighting, but it does not change the method Keller. On the basis of standard lighting for Koehler, having done some additional operations, establish the work of all other kinds of microscopes. So, for example, to move to the dark-field microscopy need after the installation of a standard lighting to replace conventional condenser dark-field (without changing the position of the other nodes of the microscope), and, looking into the eyepiece, slowly raise it until and unless there is a dark-field image - glittering particles of the object on almost black background. A glass slide for dark-field microscopy should have a thickness of 1 to 1.2 mm, otherwise the condenser is impossible to focus the light on the object. The transition to a phase-contrast microscopy more complicated. The condenser phase-contrast device is in the focal plane of the drum with a set of circular apertures of different sizes (see Fig. 2 tbsp. "Microscopy"), Numbers that appear in the window of a drum in his turn, show, what lens (X10, X20, X40 or h) should be used when the diaphragm, the value of which is visible in the window at the moment, the number Of means no aperture (work condenser in normal mode). In this position, set the standard lighting. Then focus on the drug scheduled to work lens. The image, as a rule, can be seen very bad, but we need to achieve focus. Turn the drum adjust the aperture ring. Instead eyepiece insert auxiliary microscope provided phase-contrast device. It facilitates the consideration of the areas where the image is formed. Moving the eyepiece of the microscope, achieve sharp visibility of the two rings of different density, located in the heart of the tube of microscope. One of them formed a ring opening in the diaphragm condenser; the other is the so-called phase plate - translucent ring from a special coating on one of the lens. Images of these rings, as a rule, do not coincide with each other. Movement centering screws located under the drum, move the diaphragm so that its image is completely coincided with a phase plate. After that replace the auxiliary ordinary microscope eyepiece and begin monitoring phase-contrastirovania image. Similar techniques can be obtained amplitude in contrast microscopes amplitude-contrast (antralnogo) type. After the change of the drug should check whether to keep the lighting conditions, as the thickness of the glass slides ranges and the plane of the object may not match the previously installed focus plane of the condenser. To verify you want to close the aperture of the illuminator. If the image with the lens focused on the new drug will be blurred, you need to change the height of the condenser, and then re-open the aperture to the size of the visual field. Microscope best conducted with the help of binocular nozzles; it distributes light load on both eyes, resulting in less tired after prolonged use. Despite significant progress microphotography and microinnochange in recent years, drawing vehicles remain very useful when working with thick, multi-dimensional objects that are impossible to photograph because of the large depth. Industry produces drawing machine RA-4, which is straightforward. Equipment for photomicrography (micro-Fotonika MFN and other) is simple, accessible and easy to use. However, obtaining high-quality microphotographs takes a lot of practice. After finishing work with the microscope, to cover it from dust. If used immersion lens, cedar oil, carefully wipe clean with her hand and wash his tracks front of the lens clean with a cloth lightly dampened by gasoline or xylene (soak it is impossible, as these substances can dissolve the glue that binds together the lens). Rules for the care of the microscope is described in the regulations. Smear - study of bacteria using a light microscope is widely used in medical practice. Bacterioscopic research (see Bacteriological examination) were fixed painted drugs, and the bacteria live in the state of the drugs "hanging" or "crushed" drops (see the Hanging drop, Crushed drop).